Once frozen, I peeled one, just to see how easy it was. Oh wow, look at how that skin came right off with no effort at all! For the record, we will generally be eating our peaches with the skin on, but one or two of my kids prefer it skinless – and at this point, I figure, hey whatever gets them to eat a peach, right? 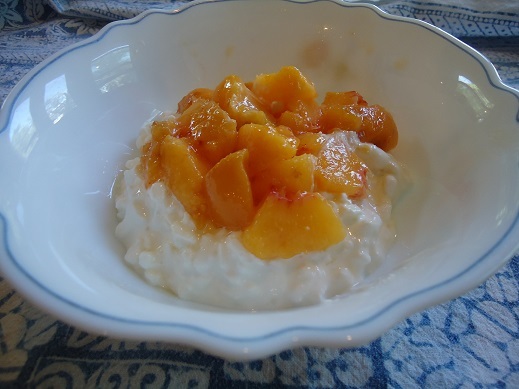 I then sliced the peach into some cottage cheese for a refreshing snack. It was heaven in a bowl. And it was practically effortless. You know what I love best about this freezing peaches whole tip? (Besides how easy it is – because truly, this process could not get any easier. Unless I send my kids to the freezer with the peaches. Which I will. But besides that.) I love that the nutrients in the peach are preserved with this method. Home canned peaches are great, but the cooking process does kill some of the nutrients. Frozen peaches though? Straight from tree to freezer, then into a bowl for a snack. Nourishing, and so juicy and delicious. Jenny – I’m so thankful you shared this tip. You’ve changed the way I’ll preserve peaches from now on. Whatever shall I do with all my extra time?? This post was originally published August 29, 2013. Laura I thought of you when I saw this on another blog!! My peaches turned brown & got mushy when I did this… So disappointed!!! So..If I froze whole peaches and then peeled the skins off…could I then use the peaches in cobblers or pies? Or will they be to mushy? From my experience, they work great for pies, cobblers & crisps! Not too mushy. They even slice quite nicely even when they’re still a tad bit frozen. Great tip. Please do another post on other fruits we didn’t know could be frozen whole! Mangoes? Guavas? I don’t know about other fruits – maybe we should experiment to find out! In El Salvador where we live, frozen mangos are a REAL treat, but mostly because having a freezer is so much of a luxury. Here we wash them , freeze them, eat them! But, that means needing front teeth that can stand that cold and also means for some people spitting out the skins. I doubt that the skins would be as easy to peel as the frozen peaches, but ought to be fairly east to peel with a peeler if you want the mango for a dessert of some kind and don’t want to use the skins. Bananas (peeled) keep for a few months frozen. They are great in Smoothies. I PUT RIPE BANANAS ..WITH THE SKINS ON, IN A FREEZER BAG , PLACE IN FREEZER AND KEEP FOR SEVERAL MONTHS. THEN I USE IN BANANA BREAD,, THAWED FIRST. . THEY MAY BE DARK, BUT THAT DOESN’T HURT THE FLAVOR, JUST MAKES A DARKER BREAD. YOU MAY WANT TO DISCARD MOST OF THE “JUICE” FROM THE FROZEN BANANAS BEFORE ADDING TO THE DRY INGREDIENTS. P.S. MY RECIPE CALLS FOR SOUR CREAM. OH WHAT A WONDERFUL MOIST BANANA BREAD! Now THAT is a reaaly cool idea. Why do we not think of these things sooner? The fur washes right off! I am the same way about eating peach skin. They are furry and I just can’t stand that furry feeling on my tongue. Woo Hoo! I need to get some peaches quick before they are gone! You can do the same with whole tomatoes. Use them for cooking. The skins slip right off just like the peaches. Best discovery I ever made. I’m going to hit our produce stand this weekend in search of peaches now. Oh, my, Jill. I just read your aforementioned post. How hungry it made me! Wishing even more now I had another freezer and had planted tomatoes this year! Yay! So glad you were able to make use of this tip! NO WAY. I must research. Peaches, plums, nectarines and pluots are so so good right now and I want some in January. Plus our freezer is just too empty. You can also freeze whole tomatoes and the skins will come right off – I do this until I have enough to can a batch. I’ve also frozen sliced whole peaches for ease of use for smoothies, etc. I just layer them in parchment paper, freeze, then place in ziplocs. I do this too. I have no time to can with the kids home in the summer with two having disabilities that require constant monitoring. I just put all the tomatoes whole in bags and freeze, then thaw and can in october while school is in session. I froze a bushel of peach slices, with the skin on to make jam with in the fall also, and will do the same with raspberries in a few weeks. Plus its soo much cooler to can in october. I can’t stand that fuzz in my mouth. Plus it feels rough on my tongue. I love nectarines and can eat that peeling. My husband can wash a peach and just eat it. YUCK!!! Good to know!! Speaking of nutrients in frozen foods, I wonder if it’s really necessary to blanch fruits/veggies before freezing. I like them better straight into the freezer myself and it’s so much quicker. Is my family missing out o all the nutrients when I don’t blanch? I think it’s safe to say you’ve just changed my whole life. Maybe Jenny should be awarded a nice prize for sharing such a helpful tip? I know I sure appreciated it! Thanks again! About a year ago I learned one can freeze avocados and guacamole. That was a huge discovery for me. Just cut the meat out, place in a ziplock and you’re good to go. I was so happy to find a way to save avocados from spoiling and a way to stock up on them when they are at their cheapest, so I can indulge in them when a craving strikes. After reading about peaches and tomatoes, I’m wanting another freezer! I love this idea, but I suspect that peaches frozen without blanching will not last as long in the freezer as blanched peaches. For something to keep a long time in the freezer the enzymes need to be denatured to stop their activity. I’m going to use the freezing whole idea for peaches I will use up in a few months. Has anyone had experience with this? How long were they good in the freezer? We’re still eating a few from last summer. They’re holding up and tasting great! I’m thinking, even though they are not blanched, maybe keeping the skin on is helping protect/preserve them a bit? Always looking for a good source of quality nuts! How great is this!! I’m taking this information to our next Ladies Bible Class to share with them, many of whom do canning but have never talked about this possibility. Maybe they don’t know…yet! Thanks so much for sharing! DH loves eating nuts. Thanks for the opportunity. Because of this post and helpful idea, I purchased a “truck load” of peaches today from a farmer’s market for a great price. Thanks to your reader who shared this too! Wow Jenn thanks. Guess I better buy more peaches. And I have tomatoes left from my garden. I wish I had seen this last week. I peeled and sliced 20 pounds of peaches. Oh well, now I know and will do this next time I have 25 pounds of peaches. I am now thinking I need to go way back and start reading through your archives Laura. I have missed out on some great info. even though I have read your blog for a few years. Thank you for re-posting some oldies but goodies while you were away! What a great idea! My mom has been making the best persimmon cookies around for many a Christmas and she has always frozen her persimmons whole first. This does a couple things. One, it allows you to pick them up on sale and keep them until needed as well as keep extras for later in the year. It also softens the persimmon to the right texture for the cookies once thawed. The skins slip off easily on the partially thawed persimmons too. I love the freezing tomatoes and avocadoes idea! Great post. I tried freezing the peaches whole last summer and this winter when I tried to eat them they were awful. Brown and muschy and unappetizing. Has anyone else had this problem? I would like to try this with peaches from my tree, but would be really upset if they all turned brown and mushy. Guess what? You can do that with fresh tomatoes too! Do it exactly the same way. Mmm fresh tomatoes in the winter for soups etc. Do you freeze them before they are ripe enough to eat or do you let them ripen all the way until they feel a little soft? Thanks! You can freeze them at any point, although I usually freeze them when they are ripe enough to eat. Thank you for providing information regarding being able to FREEZE WHOLE PEACHES. I did not know this information. Thanks for sharing this great tip again! I had forgotten all about it. I love, like you said, that it is easier than canning and retains more nutrients. Brilliant! This is so cool! I love it! I also heard recently that you can freeze avocados. . . I need to experiment with both of these. Thanks for sharing the tip! 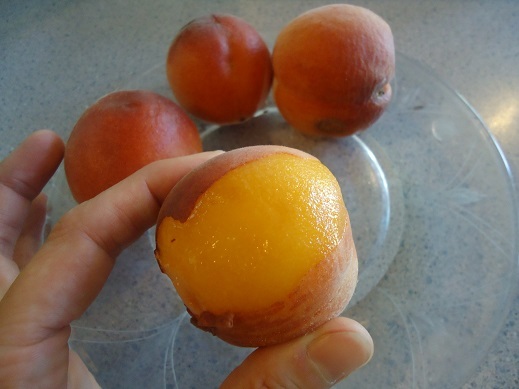 Can Nectarines be frozen the same way? Tried this last year when I read your post and it did not work at all! Thank you so much for letting me know that I can freeze whole peaches. Can I still use these for the next time I make a peach cobbler as well. And how long can they stay frozen? Yes, they will work fine in a cobbbler. They take up a lot of space when frozen whole, so I don’t like to leave them for more than a few weeks. i did freeze them whole but when I took one out to eat it melted and was mushy! Help I have a whole freeze full of frozen peaches. I’m so glad to learn about this! I’m unable to do my canning this year due to broken hand, wrist and arm. I’ve been so sad to think I won’t have any peaches! Now I’m clearing space in the freezer and will be buying lots of peaches to freeze this year! Thanks so much! This has been my favorite way of keeping my favorite fruits and vegetables since the 70s. My grandmother taught me this method because as soon as we picked them we would eat them and she ran out of time canning so she done this as a joke an low an behold it worked. I didn’t realise I was doing this for over 35years and no one knew. We do it to just about everything, just make it’s dryed well. The only thing is corn on cob, best if it’s cut off and frozen. Good luck. I have no idea what we were thinking when we went to the farm and ended up with a total of 3 cases of peaches!! The freezer is full of peach pies, peach crisp and peach cobbler… the problem is..
fruit flies…. Yikes.. and not much room left in the freezers. Fantastic idea… I don’t like canned so this is a dream come true!!!!! Thank you so very much for this info…. I froze blueberries and cherries thus year. Freezing peaches now! Wow! This is such a life saver. I was becoming overwhelmed with peaches, apples, apricots, beans, tomatoes, all coming in at basically the same time. Apricots and peaches being the most delicate and most perishable they take precedence. But, with just so many and so little time, I can freeze these and come back to them later to finish whatever I planned for them, which is usually canning so the freezer is available for meats. THANKS!! I bought 10 lbs of local peaches and we ate a couple of them first and they were delicious. 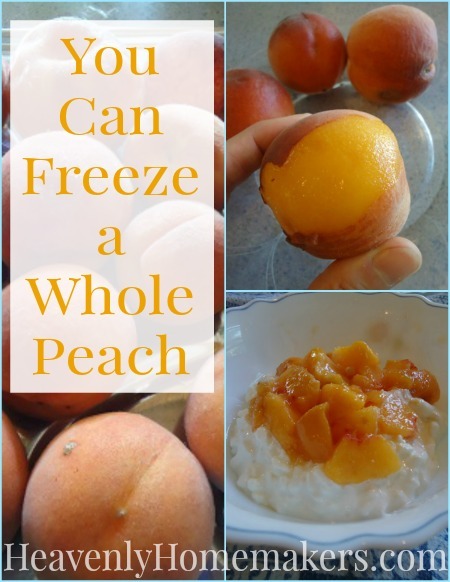 I tried this freeze whole method and when I thawed the first peach it was mushy and had lost most of the sweetness. What a disappointment! I guess the rest of them will just have to be used for puree or whatever. They will not even usable for pie. So I accidentally froze the whole peaches BEFORE washing them. These peaches were grown on the tree in my yard without any pesticides. Is it safe to keep them frozen, vacuum bag them and not worry about peeling and washing until time of use? Should I rinse them in water now, peeling away the skin and cutting off any bad spots before bagging and refreezing? I wouldn’t worry about it! Just rinse them off when you’re ready to use them! I tried freezing peaches whole but when thawed they turned brown. Didn’t look very appetizing in cobblers or smoothies. Should I have coated them with lemon juice before freezing? I just use them brown and ugly…though I like your lemon juice idea! Do you take the pit out before freezing? What keeps them from turning brown? This brown-skinned Georgia Peach is definitely jumping on this! Then, I’ll go across the Florida line and get mangoes to freeze. YOU CAN FREEZE WASHED AND DRIED GRAPES IN A FREEZER BAG. THEY KEEP SEVERAL MONTHS. OR DIP WET GRAPES IN GRANULATED SUGAR. GREAT AS A NICE COOL SUMMER TREAT ON A HOT SUMMER DAY IN MISSOURI. I make jam with my peaches closer to the winter holidays. Will the whole frozen peaches work? Help. The peaches defrosted and were too mushy to eat. Oh my heck I freaking love you!!! Thank you for the tip. I was just blanching and cutting peaches for a few hours and am still not even half way through my peaches….You have saved me so much time and I am super excited. I froze some sliced peaches last night that I didn’t skin, so I tried water on one like you said…it worked! Thank you, thank you, thank you!!! Are the whole frozen peaches suitable for baking? Healthy peaches tip. 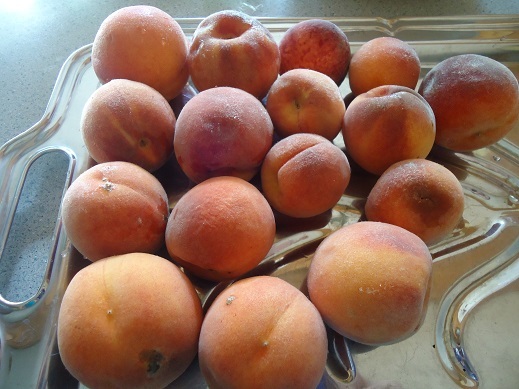 I tried freezing peaches whole with one important change….. I cut in half removed (seed) then used tray from shipping case i put the half’s back together in the half cups and froze back together then bagged. they have inside the hard seed a softer seed looks just like an almond. these seeds are best source of B18 this is a natural way to treat Cancer saved my life and others i shared this with. This healing seed works on many other disease’s too. 2 years ago i found out i had stage 4 cancer started in testicles from cell phone in pocket all day. it was in all organs up to bottom of left lung. doctors said nothing could be done. in two months they could not find any cancer. i ate these seeds handful before i juiced organic fresh living greens 1 pound juiced liquid 6 times a day and walked 3 hours a day. We took a trip to the apple orchard in northern Georgia to get some awesome apples. Along the way we stopped by the peach farm just in case they still had peaches. Praise God they did. I bought 3 bushels without a thought concerning canning. While traveling the back roads, we popped in a mom and pop café for lunch. We met a wonderful gentleman who made salsa and relishes. He told us about the wonderful tomatoes grown in the mountains just up the road a piece in Steele Alabama. Our travel plans changed immediately. We saw beautiful tomatoes growing on the mountain sides for miles. I mean dark rich colored plants growing organically. I could barely contain my excitement. Once we reached the top of the mountain there it was. A wonderful farm. You could smell the tomatoes!!! We bought 6 bushels and would have bought more if we had the room but I still had to get apples. Apples were the reason for the trip after all. We were both in heaven. My SUV smelled so good mercy. The next day we were at the orchard lol. Now let me explain. You can buy apples all day long but you cannot buy fresh picked. The Jona Prince and September wonders were being picked last week and talk about delicious. Have mercy you need to treat yourself and your family. They offer tastings so you can decide which one you want. I got one of each. The Jonas are a bit tart while the wonders are more sweet. Yep, I thought about how wonderful goodies were going to be. The difference in taste is amazing. Most apples purchased taste similar. The fresh picked is full of rich flavors that you will never forget. Have you heard the dilemma I am in? Sure you have. I tell you what waking up to my kitchen and dining room full of boxes and boxes of goodies, needing to be canned pronto had me saying, Mona Lisa you should try to freeze the peaches and tomatoes while you work on the apples. Well not sure if it would work out, I found myself here!! Ladies you made me a happy canner today. Not to mention my husband being thrilled that he doesn’t have to work all night and help peel peaches so we don’t loose money. The tomatoes were $8 a bushel, peaches $ 14 and apples $14. Per bushel. That’s the reason for the adventure. Too much rain here for the second year for good tomatoes. Peaches picked too green and shipped in. They look pretty but have no taste or smell Yuk. I’m not that desperate besides they charge $30. a bushel. Tomatoes are 25-30 a bushel and apples lol you’re not going to get a bushel. Shoot a dz can cost as much as I paid for a bushel. Heck it cost me $10 to buy enough for a single pie. My family loves homemade everything. They are spoiled but they are mine. I have raised my children as close to how I grew up as possible. My grandchildren refuse store bought pies, cakes, cookies, jelly etc. They say the secret ingredient is not there. That’s Nannys love. Remember to put your own secret ingredient of love into your food ladies and gentlemen.